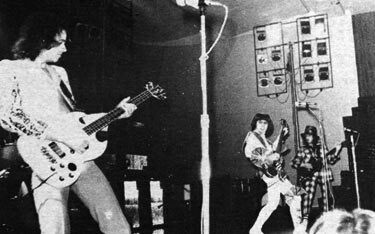 The problems that beset Nazareth when they played the Laugardals Arena a couple of weeks before had completely been ironed out when British Supergroup Slade came to Iceland for their first ever visit. Nazareth's appearance at the same arena venue had been disrupted and indeed spoiled by a terrible sound system which had not been set up properly to accomodate the acoustics with disasterous results. Slade however, as you would expect from the biggest band in Britain, produced a slick professional show with both sound and the light show being exemplorary throughout. The same couldn't be said for local support band 'Pelikan' who struggled to make themselves heard throughout the arena as they played their set through a different sound system, which was a pity especially during Asgeir Óskarsson's fine drum solo during ' How Do I get Out Of New York City' . But the crowd, made up of around 3,000 almost entirely girls aged between 10 and 15 years of age were not really interested in the musicianship of Pelikan. 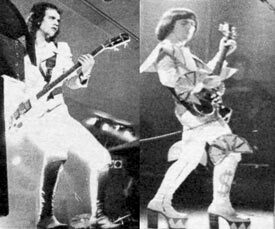 And so it was, that Slade strode onto the stage to a rapturous reception that indeed saw some of the audience fainting with excitement and anticipation as these four strangely, comically dressed men stood high on the stage above them, worshipped as Gods. One young girl was so overcome that she seemed to suffer a complete nervous breakdown and was taken to the emergency room, with the Police clearing a way through the crowd. Thankfully, there were no serious injuries during the evening, and the Police and security were able to keep order throughout, despite the frenzy that the band, especially vocalist Noddy Holder, seemed intent on inciting throughout, with various requests for the crowd to follow his lead as he made mooing sounds, or worse, farting sounds that the audience responded to gleefully. 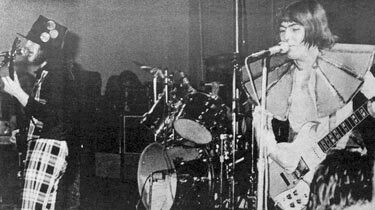 This brings into question whether a band such as Slade should even be unleashed on an audience as young as were in attendance. Those sentiments will surely come from those who were worried about the sort of bad example Slade would set for their children, a worry dismissed by Danish promoter Erik Thomsen who insisted that Iceland was ready and able to put on concerts by the biggest of world stars, mentioning that Swedish band ABBA could be next up in December, followed by Paul McCartney and Wings in April and the Rolling Stones next summer. Thomsen was more concerned that only 3,000 tickets for the show had been sold and was worried about any damages that would be caused by the rowdy audience whipped up constantly by Holder and his friends. So what of Slade? Certainly those that had come to see them didn't care about their musical talent, just looking around at the sea of faces one could see the fascination, happiness and joy expressed in each and every single young face. 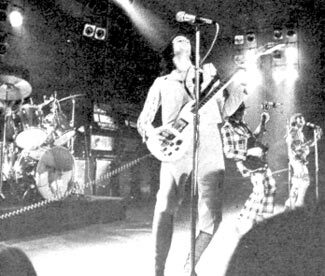 Slade are raw, unsophisticated, hilariously dressed clowns who gave their fans exactlky what they wanted and expected. Look deeper however and the suspicion creeps in that there is something more about Slade. Fools they are not, and their wild exuberance does away with the notion that musical excellence must adhere to strict rules regarding beats per minute or that it must be delivered with a funereal solemnity of those that take themselves too seriously. Slade's music is original in the broadest sense of the word, it can belong to no other band, and it is delivered with considerable skill, the dress sense tells you all you need to know before a note is played, pure enjoyment is demanded, and surely this could have a good effect on Icelandic music in general, there is a lot that can be learned from bands like Slade despite their detractors.. Undoubtedly, some pop enthusiasts will complain about these sort of groups, they were certainly loud, but the sound was clear, unlike Nazareth a few weeks previously, sometimes it was so loud that it was impossible to identify individual tones from the instruments, but it was all done so expertly, implemented by performers who can be commended for their exemplory performance on the night. They certainly know their worth, they understood how to produce the perfect show for the crowd and gave them a powerful show with an excellent stage presence as they played the music that has made them rich and famous and sounded just as they do on their records. Slade are a band who want to entertain their audience, the quality of the music is less important to them than having a good time and making sure that the fans have a good time with them, Holder even taking the time to laugh at their own image in a self depricating manner just in order to draw laughter from the crowd and keep them in a good mood throughout, as a famous poet once said "And there was Joy in the palace!"